The second we rang in 2019, the Department of Local Services officially became a standalone department. 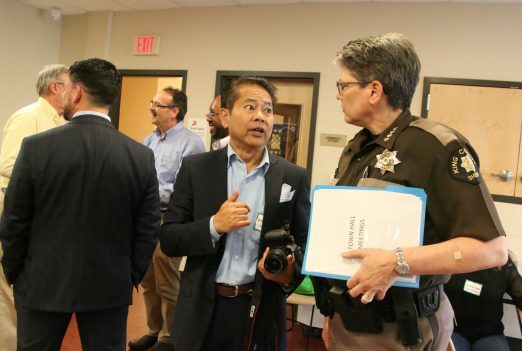 It comes after nearly a year’s worth of planning and following the Metropolitan King County Council unanimously approving Executive Dow Constantine’s proposal to establish the department. While King County has always delivered critical services to residents and businesses of the unincorporated areas – who combined would account for the second-largest city in Washington – Local Services now serves as a “virtual city hall” that helps better coordinate and deliver those services. 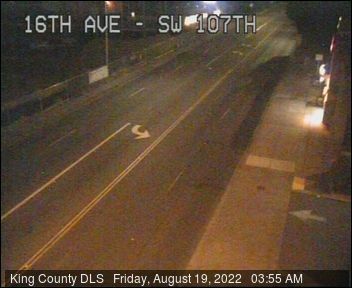 The divisions will continue to operate out of their existing locations (Permitting is located at 35030 SE Douglas Street, Suite 210 in Snoqualmie; Road Services and the Community Service Area program are located at 201 S. Jackson St. in Seattle). Led by Director John Taylor, the 500-employee department will now focus solely on serving and communicating with the unincorporated areas. Taylor previously served as an assistant division director at the King County Department of Natural Resources & Parks. He was instrumental in coordinating a landmark agreement signed last year by Executive Constantine that will simultaneously restore salmon habitat, strengthen the region’s agricultural economy, and reduce flood risks in the Snoqualmie Valley. · Danielle de Clercq, Deputy Director. Danielle is new to King County but brings with her a 30-year career in operations, management, business development, and consulting in the private and nonprofit sectors. · Cheryl Binetti, Chief of Staff in the DLS Director’s Office. Over the past 12 years, Cheryl has served a variety of roles in the King County Department of Transportation, and most recently served as the Local Services Initiative Project Manager, playing a key role in the development of the new department. As Chief of Staff, she will ensure that DLS employees have the support and clarity for timely and accurate delivery of services, projects, and programs, and to grow and develop in their careers. · Jim Chan, Director of the Permitting Division. Jim has served as the Interim Director of the Department of Planning and Environmental Review (DPER) since November 2017. He began his career with King County as a summer intern in 1989. 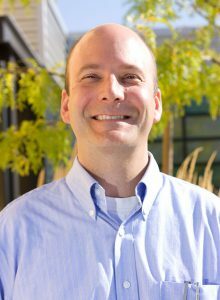 After graduating from the University of Washington, he was hired on as a staff engineer in 1991 and progressed through the ranks to his current appointment as Interim Director of DPER. · Rick Brater, Director of the Road Services Division. Rick has served in his current position on an interim basis since October. Prior to that he served as the King County Road Engineer and as the Engineering Services Section Manager. During this time, he has managed nearly $900 million worth of road infrastructure projects, including the South Park bridge project. · Bill Greene, Chief Financial Officer. Bill served as the King County Department of Transportation Chief Financial Officer from 2007-2010, and then returned in the role in 2013 after serving with the Washington, D.C. Metropolitan Area Transit Authority. Phone number 206-477-3820. · Mary Louis, Human Resource Manager. Mary has been on loan to the Department of Transportation as an HR Projects Manager since August 2018, and before that she served as the HR Manager for the Department of Public Defense since January 2017. King County appraisers have begun the annual process of visiting neighborhoods to inspect properties in-person to set the values. Citizens with questions should contact our Public Information Team at 206-296-7300. King County Executive Dow Constantine thanked the Metropolitan King County Council for its unanimous vote to establish a new Department of Local Services to improve the coordination and delivery of services in unincorporated areas of the county. The ordinance approved today establishes the new Department of Local Services effective Jan. 1, 2019 — the same date on which Metro Transit becomes a stand-alone department. Executive Constantine expects to name the first director of Local Services in October following a competitive recruitment process. It’s the county’s chance to have a conversation with you, explained County Council Chair (and District 8 rep) Joe McDermott, emceeing last night’s Community Service Area Town Hall for North Highline/White Center. “How do we act as a city?” is what deputy executive Fred Jarrett said about the launching of the Department of Local Services. That’s especially relevant to White Center, an urban but unannexed/unincorporated area. He ran the crowd – estimated at 40+ – through an on-the-spot online poll via Slido.com, with such questions as, how should the Department of Local Services communicate with you? Kevin Brown, director of Natural Resources and Parks, mentioned that Movies in the Park will be at Seola Gardens at August 4th. Lots going on at Steve Cox Memorial Park, he added, including a kids-cooking program and more. He touted the June 6th Peace in the Hood jobs event (featured here on WCN). Also at Cox Park, the new $3 million field project for multiple sports is in the works – “one of the first publicly available synthetic field in this area.” The work means Jubilee Days needs a new carnival spot this year and that has not yet been worked out, Brown said. Jake Tracy from the Department of Permitting and Environmental Review spoke next – marijuana is his main job and there’s a study happening right now regarding unincorporated areas, including a public-comment period. It’s related to concerns about clustering of marijuana businesses. It’s studying five areas including whether zoning needs to change to open up new areas “to meet our allocation from the state” and how unincorporated areas are being affected by the way things are. They’re studying complaint and crime data. The survey is taking comments through the end of June. Mark Ellerbrook from the Department of Community and Human Services, who manages the county health and homeless services, followed. He said his department also is working on the opioid crisis, including helping people who want help get it immediately. He ran through a long list of other services his department provides, including administering the Veterans, Seniors, & Human Services Levy. After short speeches, poll results from Harold – 15 participants, Sheriff and Parks were the single words with the most positive effect on the community. Social media – “local blogs” were included – won for communication choice, with e-mail right behind. Safety and homelessness were the most-cited community challenges. 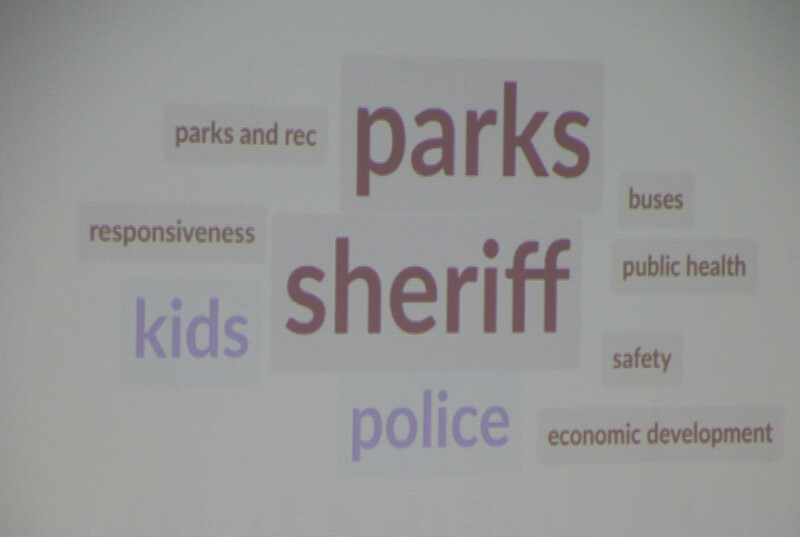 And there was a long list of suggestions for what the county could do to help the community. Asked by Carol from Myers Way about homelessness, Councilmember McDermott said it’s still a work in progress. He was also asked about minimum wage and whether the county might follow Seattle’s lead. He said it would make more sense if the state looked at its law. Ellerbrook then took on the affordable-housing issue – saying 80,000 to 90,000 units is the current estimated gap countywide. More is needed in every community, he said. Over the course of a year, 30,000 people experience homelessness, he said. 24,000 people came in for services and many didn’t need them again. “Employment is critical,” he agreed. If someone becomes ill, for example, they might lose their (expensive) apartment and possibly never be able to get into one again. 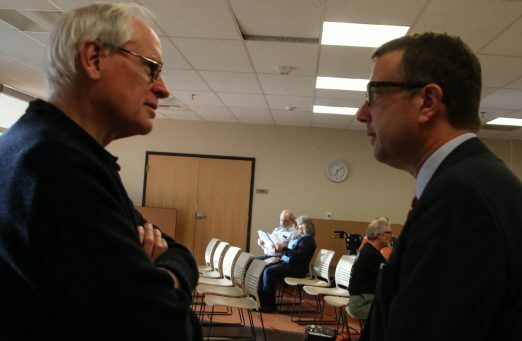 He also brought up common concerns that unsheltered people have about shelters, and how it might mean more healthy people, more people connected to services, if they can improve the shelter system. The county is working on its budgeting for homeless services and both navigation and services for vehicle residents are two areas they’re working on. Barbara Dobkin of NHUAC brought up a petition the group had circulated at last year’s Jubilee Days, talking about the area’s low-opportunity status. They want the group to study issues such as WC’s housing situation. McDermott responded by explaining the race-and-social-justice lens through which the county does its work, while acknowledging that outreach efforts need to be more successful. He also mentioned that the group was largely older, too. Jarrett also took the microphone to say that the county also is working on a plan to see how they will get to zero youth detention. He spoke about the subpar conditions at the building that the new center will replace. He also said part of it has been “reprogrammed” to be a nonsecure area where kids who need a safe place to go during a family crisis, for example, can be helped. And he went further, saying that work to get to a world where youth detention isn’t needed will take years. The next person with a question/concern, also a youth, said that White Center schools (such as Evergreen High School) need more rigorous courses, more teachers of colors, more security, more technology access, and more building improvements. He presented McDermott with a letter, and he in turn promised to share it with state legislators and Highline school board members. He said that through the Sound Transit taxing district, King County will be getting a small amount of money to invest in education for the next 20 years. Then a statement from community member Bob Price: The cause of homelessness needs to be addressed, not just the symptoms. After him, Rudy Garza from the Coalition of Drug-Free Youth, who said that marijuana access is an increasing problem for youth. They see the proliferation of stores, they see the prevalent use, and figure it’s OK. “Where does it stop?” McDermott noted that legalization resulted from a statewide vote of the people. Tracy said his work includes – as he had said earlier – looking at ways to avoid clusters of stores and to mitigate marijuana’s effects on communities. “Educating youth on why they shouldn’t use marijuana” is very important, he said. A discussion of shops’ locations ensued as well as where the tax money from marijuana goes. “We will have a report in the very near future,” Jarrett said. He added that a larger concern for people should be what percentage of their sales tax comes back to the county. Putting together the report is very complex, others added. Another speaker reiterated concerns about the concentration of marijuana shops in Top Hat, and contended that they are keeping other businesses from coming to the area. “(It’s) hurting the community in so many ways,” she said. Next concern voiced: Overgrown right of way. Taniguchi asked that specific locations be provided to reps at the meeting so they can check it out and potentially take action. 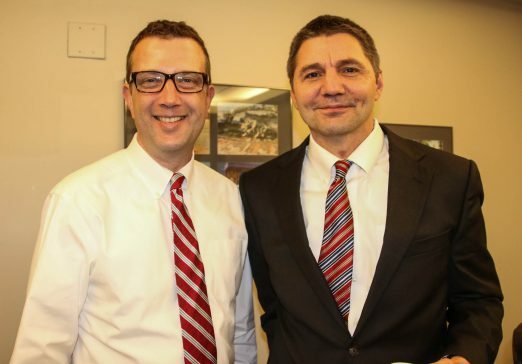 Then with one final question about the county partnering with schools – McDermott reiterated that he will share the youth concern with the school district, Jarrett advised focusing on the Legislature – the event wrapped up. The questioner countered that he doesn’t believe funding would be required for the county to partner with the district. Got a question, issue, comment for/about your local government? Tonight, bring it to the annual Community Service Area Town Hall! Your County Councilmember Joe McDermott is scheduled to be there along with representatives of various county agencies/services. It’s set for 7-9 pm tonight (Tuesday, May 29th) at Seola Gardens, 10900 4th Pl. SW. Just show up! 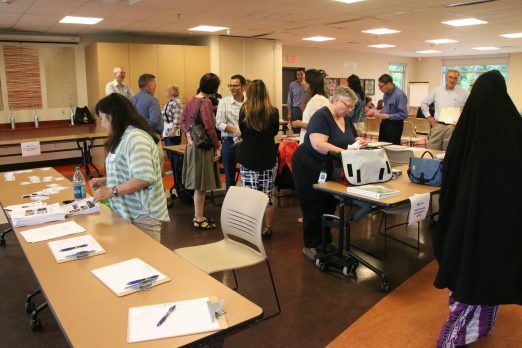 King County Executive Dow Constantine today announced 65 volunteer-led community events and projects that will be expanded in unincorporated communities with grants of up to $3,000 each. The Community Service Area Grants will enhance projects and events, such as First Aid classes, local music events, salmon habitat restoration, emergency preparedness, purchase a refrigerator for a food bank, and more. The community groups successfully competed for a total of $90,000 in grants, which range between $290 and $3,000 each. Community organizations are required to match at least one quarter of the total project costs. The projects must be accessible to all residents, regardless of race, income, or language spoken. Executive Constantine today proposed combining the Department of Permitting and Environmental Review (DPER) with various other County functions to create a new department focused on the needs of the unincorporated areas, including Redmond Ridge, East Federal Way, Fairwood and East Renton, North Highline, Skyway, White Center, and West Hill. The proposal calls for establishing the new Department effective Jan. 1, 2019, on the same date that the Executive has proposed Metro Transit to become a standalone department. Existing revenues could fund the Department of Local Services. King County is the local service provider for roughly 250,000 people in the unincorporated areas of the county; taken together, Unincorporated King County would be the second-largest city in the state. More details will be addressed in the formal legislation the Executive plans to send in February to the King County Council, and in the development of the Executive Proposed Budget for the 2019-2020 biennium. The Council has the statutory authority for establishing Executive departments, and for adoption of the County budget. Purpose: The purpose of the Community Engagement Grants is to fund community projects that offer unincorporated area residents in the Community Service Areas an opportunity to participate and be more connected in their communities. Funded projects must demonstrate how activities are accessible to all residents regardless of race, income, or language spoken. DUE: Applications are due by 5 p.m. on Friday, November 17, 2017. Funds Available: A total of $90,000 will be reimbursed for projects in 2018. The King County Department of Natural Resources and Parks Community Service Areas Program will provide funds to selected projects through a letter of award and Memorandum of Agreement. Amounts will be limited to less than $5,000 per project. Please use the King County Community Service Areas Grant Program Application Template for your application. The application packet is available (here). Marissa Alegria, CSA Grant staff lead will be available to respond to questions by phone at 206-477-4523 or e-mail at Marissa.alegria@kingcounty.gov or by setting up an appointment to meet at a more convenient location. 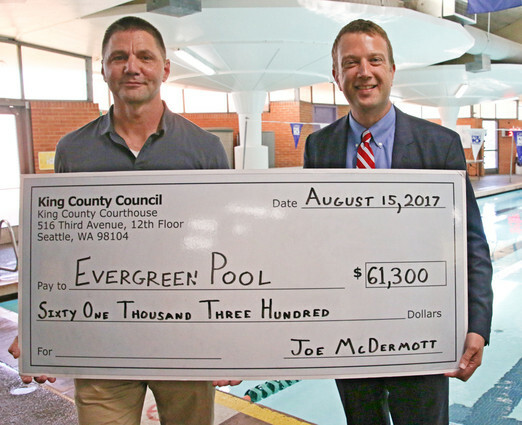 Eight years after King County closed what was then Evergreen Pool — which was rescued by a community nonprofit months later – the county is pitching in to help with some updates. The money is from the county’s Youth and Amateur Sports Fund. 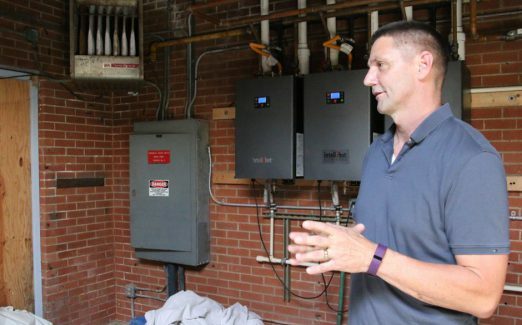 Hastings says the money will help with badly needed mechanical updates to not only the pool’s mechanical infrastructure but also to its shower system – which is also serving homeless people who need access to showers, including guests at the White Center shelter operated by Mary’s Place. Hastings says the system improvements will extend the pool’s life by decades. Haven’t been to the pool? 606 SW 116th in south White Center. Find schedule and lesson info on its website. It’s the shelter that almost wasn’t. At an acrimonious community meeting last September – when King County revealed it was weeks away from opening a shelter in its former Public Health clinic at 8th SW/SW 108th in White Center – some threatened legal action to stop it. Instead, community leaders and other residents formed a task force. They made a counter-proposal. Instead of the low-barrier, adults-only, overnight shelter that the county wanted the Salvation Army to operate, the counter-proposal was for a 24-hour family shelter to be operated by Mary’s Place, which specializes in helping homeless families. The county agreed. Mary’s Place agreed. The followup community meeting in January had applause instead of shouting. And three months ago, the shelter opened. No lawsuits. No protests. We toured on March 21st, just before the first families arrived. And that was the last time we visited the shelter – until this week, when we requested to drop in for a followup. Our tour guide and interviewee was Liz McDaniel, family-shelter developer for Mary’s Place, who has been with the organization for eight years, dating back to when it was just the operator of a “day center” – now, it’s so much more. She understates her role: “I get to open all our new sites.” And in fact, she had opened a new one the night before our conversation, at the opposite end of King County, up in Shoreline. But we were there to talk about White Center, the only fulltime shelter in the WC/West Seattle area. As of our Tuesday morning interview, 15 families were there, 55 people – 20 adults and 35 children. And there’s still room for more – official capacity is 70 people. “Guests,” as Mary’s Place refers to the people it’s sheltering, are referred by the county program Coordinated Entry for All, which works with the 211 hotline. The play area is the work of the Seattle University College of Engineering, we’re told. And like so many other things at the shelter, volunteers helped make it happen, including those who cleared the area of its weedy plantings. 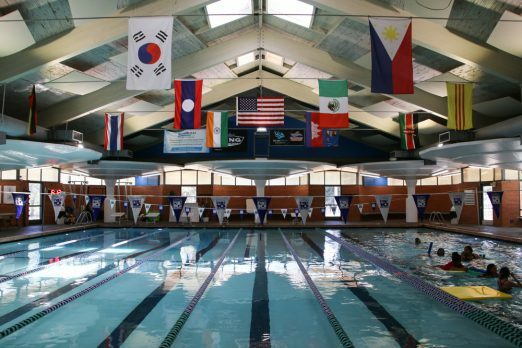 Other work that is expected to be done by mid-July is adapting a restroom to make it accessible, and adding two showers in what was a storage area so the building has three – the Evergreen Aquatic Center, a mile away, has in the meantime been making its showers available to shelter families. In the meantime, all the laundry has to be sent offsite. And a “small kitchen” is being added as well, so some cooking can be done at the shelter. So what happens during the course of a day at the shelter? For the adults- “services that focus on housing and employment.” Throughout the open spaces in the shelter, there are signs, and set-aside areas, devoted to those focuses. Mary’s Place also has launched a new “diversion program to help divert families from shelter directly into housing,” which requires “flexible funding,” so if you’re looking to donate money – that program could use it, she adds. For the kids, there’s an immediate effort to be sure they are enrolled in school, and to arrange for transportation “within 48 hours of arriving.” This location is on school-bus routes, though at some of the other Mary’s Place sites in the region, they work with Metro, taxicabs, “whatever.” Now that school is out for the summer, the focus is on activities; McDaniel says they have been “working all year” on getting scholarships to day camps around the area, and kids are already out at camps ranging from art to environmental activities. Health care also is available through the shelter, with a nurse on site part of the time. While Mary’s Place works on “a 90-day model … some families have more extended barriers” and it takes longer for them to get back onto their feet. Especially refugee families, McDaniel notes. Most of those who Mary’s Place is serving now are from East Africa, particularly Eritrea, though MP also has seen “our first few Syrian families,” as well as some from South Asia and Central America. Those working “together” at this shelter include about 20 staffers as well as the 55 guests, and volunteers. The guests have responsibilities beyond seeking housing and (if not already employed) work: They are assigned chores, for which points are awarded. Those points can be spent at an on-site “store” with items such as clothing. The youngest guests are able to earn points, too, and they have what the sign on the door dubs the “mini-mart” (top photo). A far cry from last September’s rancor. WHAT YOU CAN DO: There’s a “daily need” for volunteers at the shelter – especially to help with the kids, “with outings, and during the school year with homework help,” McDaniel says. No prerequisites except to be “people who like people.” Information on volunteering is on the Mary’s Place website. For donatable items – blankets and diapers remain their biggest need. Yes, the kids at the shelter right now include babies. And the biggest need of all is space – this shelter is open, the aforementioned new one in Shoreline is open, but the need for more shelter space around the metro area continues. Despite that, this shelter is not intended to be permanent; the county and nonprofits are working on a long-range plan for a mixed-use project at the site that would include housing as well as headquarters for several nonprofits. That’ll be the topic of a separate followup. 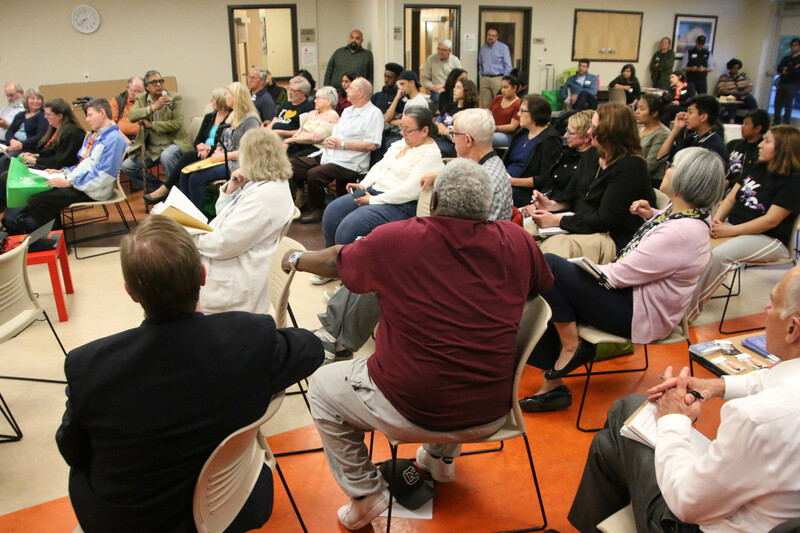 1:06 AM: In case you wanted to go to Wednesday night’s “town hall” for North Highline, part of the King County Community Service Area program, but couldn’t – we recorded the presentations and Q/A. It was held at Seola Gardens. Of the three top-billed county officials mentioned in previews, King County Council Chair Joe McDermott – who represents our area on the council – and Deputy County Executive Rhonda Berry were there; Sheriff John Urquhart was not – his chief of technical services (including 911) Patti Cole-Tindall was there instead. Many other county officials there, including County Assessor John Arthur Wilson, County Transportation Department Director Harold Taniguchi, County Parks Director Kevin Brown, and more – you will see all the introductions at the start of our video, which runs an hour and a half and is unedited. Alan Painter, manager of the Community Service Area program, facilitated. 7:33 AM: One attendee, community advocate Gill Loring, tells WCN that a participating county official talked with him afterward to correct something she had said – Karen Freeman from the county executive’s staff said that local businesses are not required to have garbage pickup, but later acknowledged that’s inaccurate – they are. The following meetings are hosted by Best Starts for Kids. Each 1.5 hour meeting will be focused on Best Starts for Kids’ information with numerous BSK staff present. You can expect a short presentation followed by breakout sessions with BSK staff. You’ll have an opportunity to learn more about the RFP process, data, evaluation and community partnerships. Wednesday, May 10, 2017 @ 6:30 p.m. The list of other meetings around the county is here. Find out more about BS4K here.